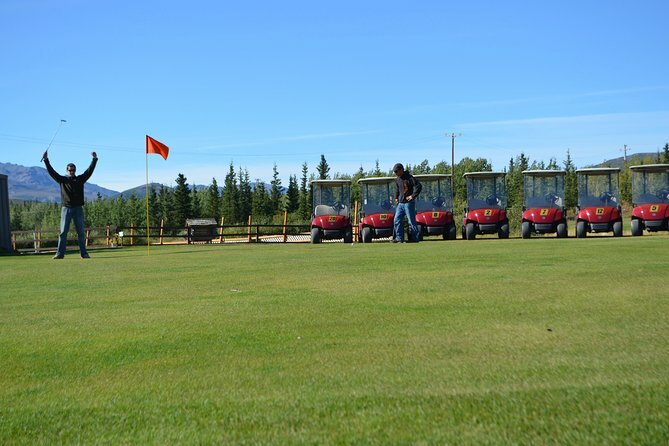 Enjoy a truly unique golfing experience with a 9-hole course on the Alaskan tundra. Bask in the beauty of the surrounding mountains while keeping an eye out for natural hazards, including moose footprints that act as makeshift traps and a resident fox known for stealing balls. Book a cart or enjoy a leisurely walk between holes on this Black Diamond Resort course — one of the northern-most golf courses in the world. Experience a truly unique golfing experience high in the mountains of Alaska. Enjoy round-trip transport from your area lodging (or make your way on your own) to the Black Diamond Golf Course for a one-of-a-kind 9-hole game. Choose between driving a cart or walking between holes on the course’s rugged grass. Then, prepare to play. While the grass is real along the course, the ground is often frozen and it can be challenging to even push your tee into the tundra. Fairways are also full of interesting hazards, including a sly resident fox and the occasional moose tracks. Don’t miss this wonderful opportunity to bask in the beauty of the surrounding scenery and the wildflowers that spring up annually throughout the course, breathing in the fresh mountain air as you go. Your package includes unlimited greens fee, club rentals, a pull or power, souvenir logo ball, tees, scorecard, and six golf balls to play. Reservations at Black Diamond Grill are also available before or after you game for a fabulous full-service meal.